I laid in Bed....it was warm, I was tired, Muscle Man was sleeping... I DID NOT WANT TO GET UP!! Last year at this time I would hop out of bed ultra excited to dominate a Long Run.. Not sure what shifted. I knew I NEEDED to get up and get moving. The Fleet Feeters were on the trail including Endurance Girl HERE, the local Power Bar rep. Janna texted that she would be late so I formed a plan to run out 1 mile then loop back for her, the out and back was only 15 so I had to make up miles anyway. So I spent the first mile chatting with Endurance Girl, come to find out Power Bar has the course support at Boston, GOOD TO KNOW, and Endurance Girl is an Iron Woman a few times over, SUPER COOL!! Before I knew it the mile was up and I ran back to get Janna (AKA Lioness). The other Fleet Feeters on the trail were great asking "Are you OK?" with concern.. I told them I didn't want my Little buddy to run solo.. The cows were out in the muddy field showing off their new Calves, 5 of them played hopping and rubbing noses, TOO CUTE! I found Janna and we were off. This run was TOUGH! I was tired from the minute I started running, my body is telling me something, maybe I need more vitamins.. I can usually remember my runs in vivid detail, but not when I am tired. All I remember is a family of 6 doing a workout. The oldest about 14 ran ahead, Mom tried to keep up, a little one about 10ish was slumped over almost crying, while the 8ish year old swapped pushing the Jogger with the little one about 2 and Dad. I wondere4d how often they worked out together. 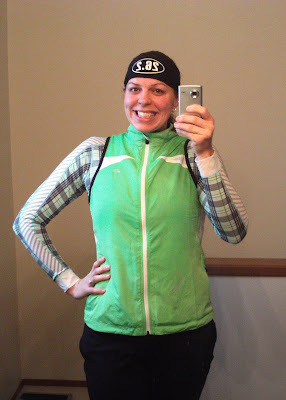 Gear: Bondiband, Helly Hansen base layer, Brooks vest and Brooks Spartan II pants. I thought I turned my phone off but at about 7AM I could hear it buzzing, about that time Little Stud #1 was thirsty. I checked and it was a text from Zoe HERE who wanted to do 9 miles!!! I needed to get in 8 miles total since I missed some miles earlier in the week, so I asked if she could come meet Amy and Me. She could!! I was SUPER EXCITED, have not run with Zoe in ages, since before Goober..
Amy, Zoe and I set out on a drizzly rainy run, the goal was about 10:30 pace (RECOVERY RUN). I did not wear a hat and immediately regretted it, but the temp was OK and the rain was refreshing. We all chatted as the miles ticked away. Amy headed back at 3.5 to Finish with 7 miles, I FELT BAD!! I wanted to loop back, drop her off and go back out, but she seemed determined. I am sure in the weeks to come we will all stay together. Zoe and I hit stride like we had never been apart, what a JOY!!! Considering how GROSS I felt the day before my heart was full as the miles passed easily. We got close to the turn and Zoe said "Want to do 10?" How can I pass up more miles?? Then I said we needed to do 10.2 so I could run a full Marathon over the 2 days. Mid-way we stopped to stretch and made friends with an Osprey in the Buffalo field, we named him/her Florence (Flo). He/she was puffing up the feathery chest and rubbing it on the fence, it was funny. There were very few people out, but we did meet another friend, a Salamander that looked like a branch on the trail. I spotted him near Zoe's sneaker, we stopped and she kindly lifted him off the trail for safety, we named him Salavatore (Sal). Our trail friends are growing, we did not make it far enough South to see Sam and his Bald Eagle buddies, maybe next time. Hmmmmm Maybe I just need to slow down and enjoy?? Thanks to Zoe and Amy for a WONDERFUL and relaxed morning run..
26.2 for the weekend!! I burned a ton of calories and earned my chance to EAT on Super Bowl Sunday, which is another story, but I am out of time for today..
Running? Eating? Watching the Half Time show?? Awesome miles! I got in 25 miles on the bike friday night and a few short runs saturday and sunday. Sounds like an AWESOME weekend. No running for me, but I did play a 3 set tennis match. I might have burned off 1/5 of my Super Bowl fun. Great job!! I did 8 miles on saturday and 17 (alone!) yesterday. I so wish I had lots of fun gals to run with. You guys are lucky!! All your running is make me jealous. I only ran a little bit yesterday and then switched to biking because I wasn't feeling well. And then I moved on to eating. Ugh! I think I might have overdone it. Today's a new day, right? great job this wknd. some mornings it is so darn hard to get out of bed!! Saturday was full of shopping with the fam, got some new running gear at Kohls on Clearance and some new showlaces, so I was all excited for Sunday's Long run. My long runs so far have been around 6.5 miles and I knew I needed to do more. I did 8.43 in 1:37 and change! An 11:35 pace is still slower than I would like, but I did have to walk a bit as it was 2 miles more than I have ever run!!! My hips and knee are feeling it a little today, but nothing I can't handle! Good job with the 2 day marathon! I was in Idaho just for the weekend. I got to run 6 miles while there and my last two were the fastest I had run! Because of my trip I wasn't able to do my 12 mile long run yesterday so I'm making it up today but enjoying staying in my nice warm house for the moment before I'm brave enough to head outside (longest run since Portland Marathon!) At least it's not raining right now tho so I need to get moving before it does! I just saw Zoe's recap of your run on FB - you guys are too fun! AWESOME job on the 26.2 this weekend!!! Sounds like a great weekend. I'm so jealous of all your running buddies. Normally my runs are on my own. This weekend was great! Snowy bike ride on Saturday and 11 very snowy trail miles with friends on Sunday. 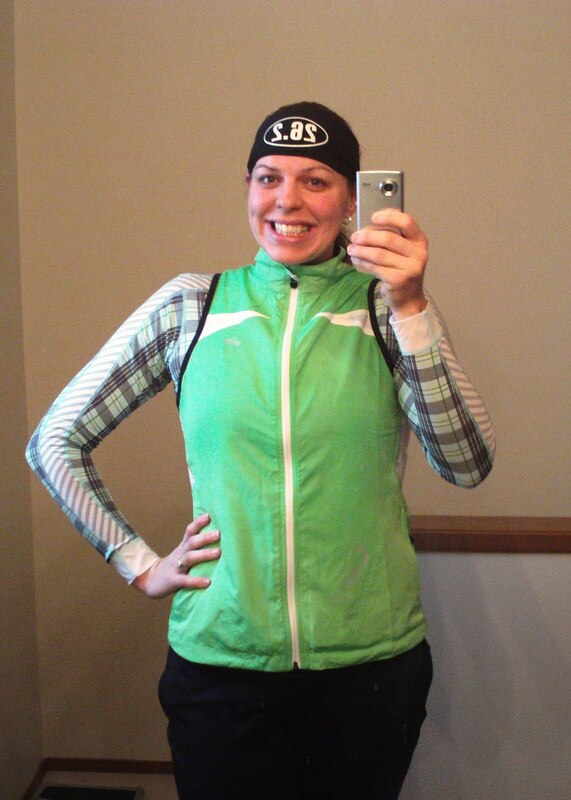 I'm ready for spring, but running in the snow is pretty cool. Awesome running, Mel! A marathon in 2 days, really good pace on a run you didn't feel good on, time to catch up with friends - what a great weekend! Awesome bondi-band! Hopefully I can get myself some 26.2 gear soon, too! I did 7 on Saturday and another 7 on Sunday - trying not to overdo it and get hurt these last few days. I LOVE that you ran a marathon this weekend. You are such a rockstar Mel! Wow - awesome weekend for you!! I did 10m on the gym track on Saturday, my first long run in quite awhile. Sunday was all rest... but I was going crazy during the football game, and hubby is pretty sure I put in a workout!! But today we're World Champion Packers! Hoot-Hoot! awesome runs Mel! You're inspiring with how you still get out there and get it down! And I'm so glad to be reading about you and Zoe together again! sorry to hear you were so tired on your run. You should get a blood test to find out if you are lacking any particular vitamins so you can take care of that! Congrats on running 26.2 this weekend, how great that you got to enjoy the miles with friends, too. Hope your week is off to a good start. Any run with Zoe qualifies as an awesome one, so congrats on that. I had a good weekend, set a new PR at Surf City Marathon - 4:23:38. Beat my old time by 15 minutes. Yay me. the half time show sucked!! But I had a pretty good weekend. Had to cut my long run doen 2.5 miles, but other than that it was good. Hey! It was GREAT meeting you on Saturday and fun running together for a bit. You have a fun blog...I am a hit or miss blogger :). I will definitely send you some product to sample and review. What's your email address? Way to power through the miles! You are blessed with running friends. I love salamanders and newts! I can't wait for that weather to return to the EAst coast again. I'm ready to complain about sweating too much! I ran a little and ate a lot. Ekk! I'll have to crush the miles tonight. Great job! It's great that Sunday's run was so much more enjoyable than Saturday's and that you could end the weekend on a high note. How fun to have so many running friends to run with. Geez! You did a marathon over the weekend! Put that in your back pocket! You totally earned your right to partake in the SP festivities & eats!! You have so many real life running buddies!!! Love it! Do good to hear you busted through it! Awesome work on the runs! !